Wow! Most excellent! And I still miss Chris' presence in this world. I first saw the clip over on YesFans. Lucky Seven is one of my favorite tracks from my favorite album of all time. You never cease to amaze me with your ability to nail Chris' parts as well as get the right feel and tone. The album has such meaning to me that I generally save listening to "Fish Out of Water" for my camping trips when I listen to it at sunset (around a camp fire). I have a trip planned this weekend and I will be "seeing" your playing as I listen to lucky Seven. WOW!!!! What a wonderful tribute Miguel!!!!! It is SO GOOD to see and hear you play again. I bet wherever Chris is....he is smiling. Great choice, GREAT performance Miguel. Did you run that bass through a Chorus unit??? Sounds like it. Or, is its fullness due to the doubling of your bass along with the original bass track??? Thanks to everyone who replied and watched the video! Yes, Greg - the chorusing is induced by the doubling of the original bass because it's mixed, as you know, loud enough to stay in a similar level as mine. I have a new video coming out in the next days - as always : Hopefully, Eventually! Very nice Miguel. Thanks for the effort. Chris would be proud! I hope you don't mind me asking but why did you decide to use that Telecaster bass? I know the original was played on one too but with the earlier model having one single coil PU in the middle and an added Jazz Bass PU (?) nearer the bridge. Those post '72 Tele's were a very different sounding beasts with that booming humbucker near the neck. Have you played "Lucky Seven" with a Jazz Bass? 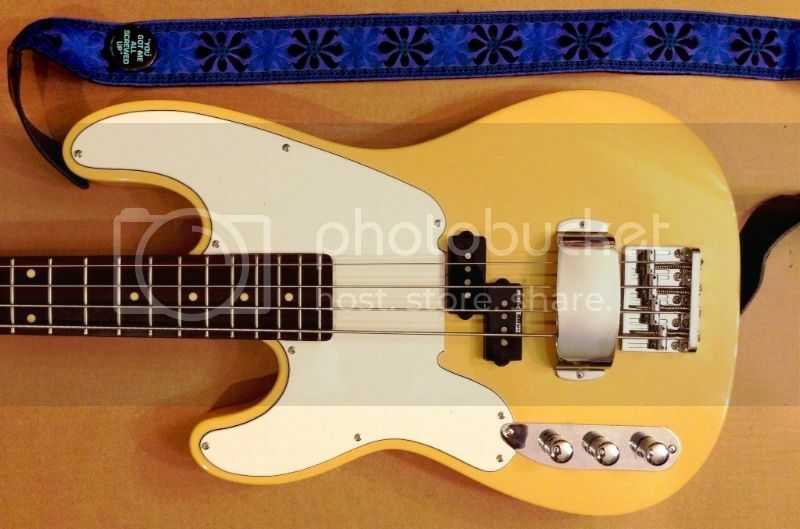 I always thought Chris used a Jazz on it until he revealed it was the white modded Tele. Anyway; great work as usual. EDIT: On a second listen, the neck 'bucker gives a nice 'second tone' to the song while Chris' original bass tracks still chimes at the background. Very nice. I am now trying to start building basses from parts and I will try to recreate that telecaster at some point. Right now I am making a Jazz bass. >How is the Jazz bass build coming along? >Any chance you might consider making a tutorial video for "Lucky Seven"? I would love to learn this but my first two attempts trying to follow you had me missing quite a few notes. As a lefty, my choices of Tele basses are extremely limited. Here's my Tyyster Telecaster which I just had modded with a bridge pickup. Inspired by you know who. The bridge pickup is a custom made SCPB, just a bit wider than the Seymour Duncan SCPB-1 neck pickup.